It’s Halloween.We toyed with the idea of throwing a government shutdown-themed party, but then we thought, “What’s even scarier than the US government dealing with a problem that they know exists?” That’s right. A problem they don’t believe exists. Global Warming. 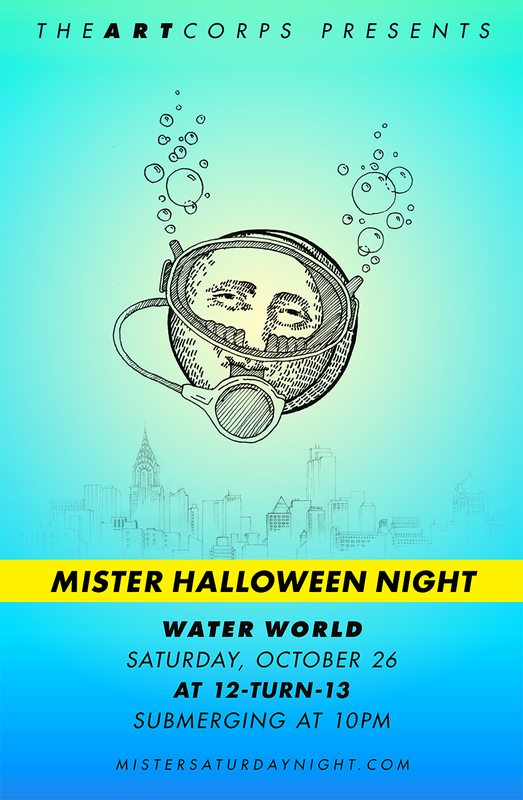 And so we bring you, on this scariest of holidays, Mister Halloween Night: Water World. We’ll be transforming 12-turn-13 into an underwater city in which jellyfish take the A train, and you practice your best synchronized swimming moves on the dancefloor. Mermen Eamon Harkin and Justin Carter will spin the deepest whale songs never heard by man; and the Neptune-like gods of theARTcorps will attach starfish to buildings and use bioluminescent creatures to light the disco ball for your visual pleasure. Costumes are required if you’re gonna take the plunge with us, but don’t feel limited to Little Mermaid get-ups. Think melting ice caps, Jacques Cousteau, Noah’s Ark (we want to see a lot of animals, two-by-two), scuba divers and polar bears in Bermuda shorts. Group costumes will keep you afloat the longest, and if you don’t dress up, you’ll be stranded. The flood begins at 10pm. Don’t forget your water wings.